﻿National Cheeseburger Day: Calendar, History, Tweets, Facts, Quotes & Activities. 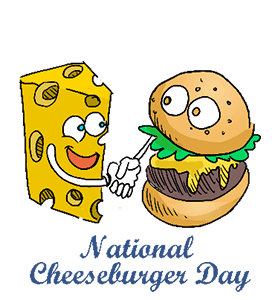 National Cheeseburger Day is a day of appreciation for cheeseburgers. Typically when cooking a cheeseburger, cheese is added to a hamburger patty a few seconds before the patty is removed from the heat. This allows the cheese to melt onto the burger. According to an obituary published by Time in 1964, Lionel Sternberger created the cheeseburger in 1920s, when he placed cheese on top of a hamburger as an experiment. Sternberger was 16 and worked as a cook in his father's sandwich shop in Pasadena, California. Aside from cheese, other cheeseburger toppings include ketchup and mustard. This tasty national holiday is celebrated each year on September 18th. According to the US Department of Agriculture, the average cheeseburger contains 303 calories and 30 grams of carbohydrates, as well as 41 mg of cholesterol. In 2008, Burger King released a men's cologne called Flame. This cologne was marketed as the scent of seduction with a hint of flame-broiled meat. Each year, McDonald's serves more than 5 billion burgers, which translates into a heard of 25 million cows. According to archeologists, ancient Egyptian tombs contain murals about cheese making, which date back to 2000BC. Enjoy a cheeseburger for lunch or dinner. Try it with an exotic cheese. Our favorites: Havarti, blue cheese, smoked gouda and goat cheese. To try a twist on the traditional cheeseburger with a veggie, tofu, lamb, bison or chicken patty instead. Enjoy a free cheeseburger or a cheeseburger upgrade on this national holiday. Some restaurants are offering free cheeseburgers for downloading aps, others free upgrades and others free cheeseburgers for sharing promotional hashtags.